VOCAL-NY is a grassroots organization building a movement led by low-income people of color to end the AIDS epidemic, the war on drugs, mass incarceration and homelessness. They accomplish this through community organizing, leadership development, public education, direct services, participatory research and direct action. In its 20 year history, VOCAL-NY has won policy changes that saved or improved the lives of hundreds of thousands of New Yorkers across the state. Guiding Vision: VOCAL-NY envisions a healthy and just New York that strikes down inequity and injustice. They approach their work with a firm belief in harm reduction, radical equity, justice, love and compassion, and recognize that societal change that abolishes inequity and injustice will only be won by building the leadership and power of the most marginalized among us. HIV/AIDS Won ‘HASA for ALL,’ an expansion of lifesaving housing and services to all people with an HIV diagnosis in New York City, expanding lifesaving services to an additional 7,000 low-income New Yorkers living with HIV/AIDS. Won the HASA 30% Rent Cap, a 10-year campaign that resulted in a 30% cap on income paid for rent for approximately 14,000 NYC HIV/AIDS Services Administration (HASA) beneficiaries. The policy, enacted in 2014, saved thousands of people from becoming homeless, and increased thousands of people’s disposable income for basic necessities like food, medication, and transportation. Passed a bill in New York City to require that all homeless shelters have someone trained on reversing overdoses on site at all times. Expanded access to the opioid overdose antidote naloxone by passing a state law in 2014 to allow standing orders, through which harm reduction staff, pharmacists, and other healthcare workers may distribute the medication without a physician being present to write a prescription. 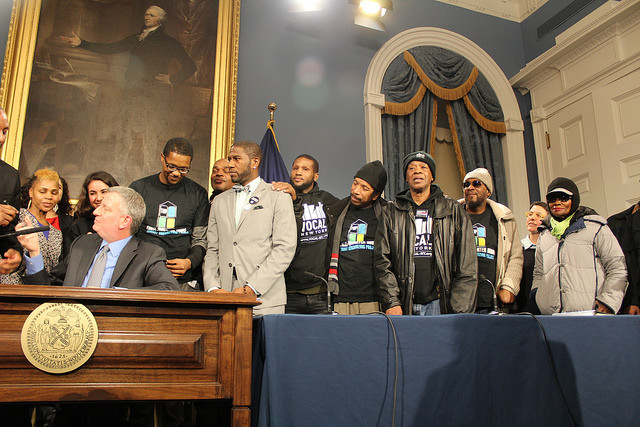 Passed the NYC Fair Chance Act, the most progressive fair chance hiring policy in the country, that gives people with criminal records a fair chance to find work. Pressured Medicaid to drop harmful restrictions on coverage for hepatitis C (HCV) treatment, granting access to treatment to thousands of New Yorkers with hepatitis C.